I’m a little kid when it comes to flashlights, always have been, always will be. I keep a flashlight with me 24/7. Nothing makes a man more than his flashlight. 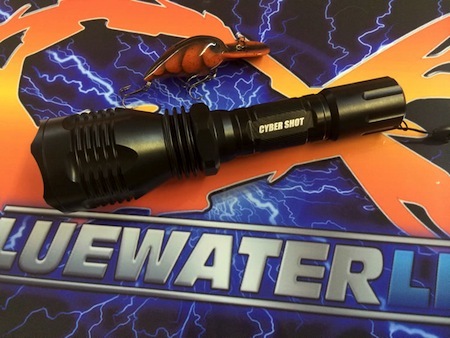 I got an email today from Blue Water LED today letting us know (the people on the Blue Water mailing list) that they have a new product in stock and it is called the Cybershot Sniper Flashlight. It took me all of 10 minutes to order one. There are a couple of things that caught my eye, and I will review them when the Cybershot Sniper Flashlight arrives at my door. According to the email this flashlight will fire a narrow beam over 1500 feet, and a single charge of the included batteries will last up to 6 hours. It comes complete with 2 batteries and a charger. One really cool feature is that if you have charged batteries, you can slide them into the charger, unplug the charger and plug your cell phone right into the built-in USB port and charge your phone. A decent backup battery pack for a cell phone will run you at least $40. Why not spend the extra coin and have a manly flashlight with this feature built in anyway? How many times has your cell phone died, and you wish you had a power source on hand?. This is the excuse I am going to give my wife for buying the flashlight, I urge you to do the same. I will do a “Jim” review when it comes in, I cant wait. Until then, check it out on the Blue Water website by clicking here. Below are pictures I borrowed from the Blue Water website.